My first impression today is about a powder that I am constantly hearing about that I decided to finally try. 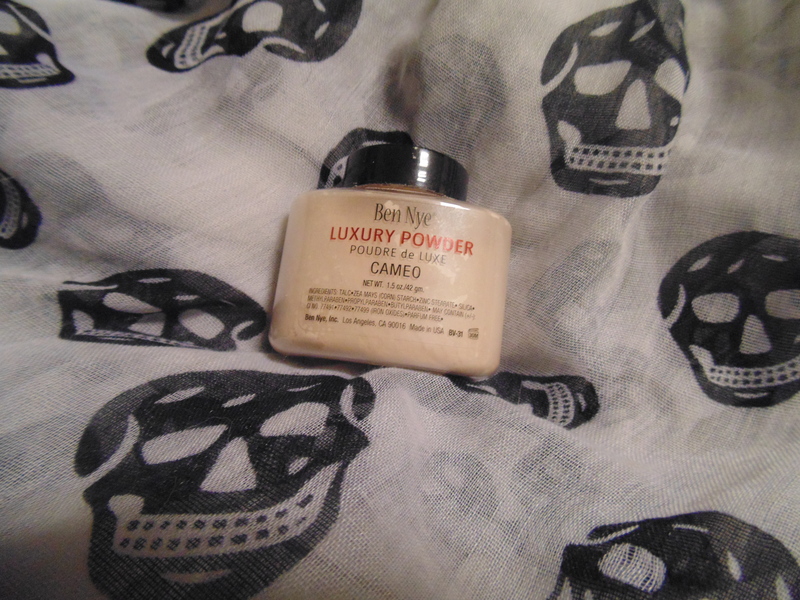 I have heard from several beauty bloggers that Ben Nye’s luxury powder in “Cameo” is the perfect undereye and setting powder for very pale skin. I got a 1.5 oz container of this powder off a trusted seller on ebay for $12 shipping included. Sounds like a lot for 1.5 oz, but a little bit of this powder goes a long way. Let me just say that I am in no way affiliated with this brand before I begin…this powder is AH-MAI-ZING. I put this on over my under eye concealer and it legitimately looked like I was blurring my imperfections out. You know that photoshop technique where they “soften” faces to make them look a bit blurry and make pores magically disappear…yeah…this powder does that. I am not even kidding. Ben Nye is a brand that sells a lot of theatrical makeup if I’m not mistaken. So, it would make sense that their powders would blur imperfections a bit since stage performers are sometimes in very harsh lighting. Like I mentioned earlier, a little bit goes a long way with this powder. My favorite way to apply it is to sift a bit into the lid (yes, it’s a sifting type powder) and put my damp real techniques sponge in it and dab it under my eyes and a little on my face to set everything. You could also use a brush, of course. I like to apply powder with a damp beauty blender because it blends everything together and doesn’t make my skin look cakey, which can be a problem with skin types that tend to dry throughout the day rather than get oily. It unites my makeup together? It blurs and it unites. Makes sense, right? I’m trying, folks. It’s hard at times to properly describe a powder in words because it’s not a color like pink or red. It’s just a powder. This shade is for pale skin. I know that Ben Nye “banana” has been talked about forever now because of Kim Kardashian, but banana shaded things will not look right on pale skin, unless that’s the look you want. If that’s the look you want, rock it, but if you’re looking for the shade meant for pale skin then cameo is it. It’s white. Like…white. It doesn’t look white on my skin (or maybe I am just that pale) but in the container it is white, but it’s not fully translucent on the skin. This powder did last all day and did not oxidize at all! I am so impressed with this powder, and probably will not be buying anymore for a long time. If you find a great thing, stick to it until something prettier comes along, right? I would recommend this powder to anyone that is struggling to find a setting powder that won’t oxidize, but don’t want to spend loads of money trying out new powders (I kinda did…oops).